ShopSocially Unveiled in a Joint Webinar with Demandware and Avenue - How merchants Can Get Up to 40% More Revenue This Holiday Season? ShopSocially joins cloud-based eCommerce service provider and plus-size women’s fashion clothing leader to guide eCommerce merchants on how to reap up to 40% more revenue from their holiday traffic, by using unique social, referral and loyalty solutions. ShopSocially proved to be a successful social commerce partner for Avenue. We are very happy using ShopSocially apps on Demandware platform as they are helping Avenue to succeed. - Kristen St. Peter, Director of eCommerce at Avenue. 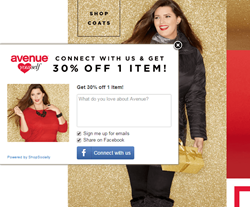 On Wed., November 4, 2015, ShopSocially and Demandware hosted a three-way webinar with Avenue, a leader in Plus Size Fashion Clothing titled ‘How to Get Up to 40% More Revenue from Your Holiday Traffic’. Presenting the webinar were Kristen St. Peter, Director of eCommerce at Avenue and Samir Palnitkar, President of ShopSocially. It was hosted and moderated by Liz Lynch, Partner Marketing Specialist at Demandware. Tapping into his 20 years of industry experience, Palnitkar and his team created the ShopSocially Omni Channel Marketing platform. It comprises of a referral program that helps in new customer acquisition, modules which remove conversion barriers and provide social proof, and loyalty solutions which ensure that clients come back for more. Complementing these functions is a list of features including easy personalization, detailed reporting, A/B testing, and mobile friendliness. ShopSocially offers seamlessly integrated apps plugin for major eCommerce platforms such as Demandware. To showcase the power of ShopSocially’s solutions, Palnitkar invited Kristen St. Peter from Avenue to share her experience and results of using ShopSocially solutions on Demandware platform. According to the plus size fashion clothing brand’s Director of eCommerce, the first ShopSocially app they implemented was the Social Connect App for viral email acquisition. The second ShopSocially app Avenue embedded was Share-a-Purchase App, which turns buyers into brand ambassadors by allowing them to share their purchases with friends in return for a small discount on their next purchase. The app has also helped acquire new customers via referrals, generate real-time social buzz, and increase repeat purchases by 26%. Together with the Social Connect App, Share-a-Purchase App helped Avenue get thousands of word-of-mouth referrals on social media, improve their standing on search engine results pages through social sharing and backlinks, and enjoy a 11.5x ROI on their efforts. Individually, the first app converted visitors at a 28.48% rate while the latter converted at a 14.88% rate. These numbers were easy to track thanks to a personalized dashboard ShopSocially created to help Avenue track a comprehensive range of metrics including word-of-mouth referrals, email subscriber growth, and conversion uplift. After sharing Avenue’s results with ShopSocially, St. Peter invited Samir Palnitkar to provide eCommerce merchants with a few valuable strategies for holiday season. Samir first recommended the use of a referral marketing program for the holiday season to deliver up to 15% increase in traffic. He also suggested the use of social login to remove conversion barriers. To further boost conversion rates up to 15%, Palnitkarproposed the use of visual commerce and customer Q&A becausethey add social engagement and social proof to the website. He concluded by emphasizing on the need to focus on 360 degree loyalty suite, especially since 20% of future revenue comes from existing customers. Avenue® is a leader in the fashion industry for plus size clothing. Started in 1983, Avenue® has been committed to offer quality products of plus sizes. Over the years, Avenue® has carefully adjusted the proportions on petite, tall and extended size clothing to accommodate the needs of their entire customer base. Avenue® has continuously improved its fit formulas, resulting in a truer, more forgiving fit in all areas for their customers. ShopSocially is a premium social, referral, and loyalty platform for marketers. It is an enterprise grade SaaS solution that helps merchants in new customer acquisition, improved conversions and increased customer retention. Leading brands such as Evelyn & Crabtree, Beretta, Dressbarn, Zazzle, Zipcar and ULTA use the ShopSocially platform to drive referral marketing, visual eCommerce, customer loyalty, social login, social gamification and other similar programs on their sites. ShopSocially has consistently driven word-of-mouth promotions via social media for 1000s of brands and delivered positive ROI results for its social media efforts.